The Liberal Bee Jay eight game winning streak ended Friday night after the BJ pitching staff walked seven in a 7-4 loss at Brent Gould Field. Haysville takes an even more commanding lead in the Jayhawk improving to 16-5 in league play at 20-6 overall while Liberal falls to 9-7 in league and 17-7 overall. 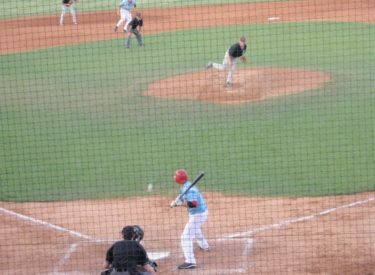 The Heat built a 4-0 lead on starter Parker Markel by plating one in the third and three in the fourth which included a two out two run homer by Justin Miller. The BJ’s had their home crowd in a frenzy when Chandler-Gilbert’s Aaron Mees doubled off the center field wall to drive home two runs in the fifth. Another run would score on an error to make it 4-3. Rhode Island’s Kyle Borden lead off the sixth with a double and would score when Lubbock Christian’s Richard Bohlken hit a sacrifice fly. But the Heat came right back with three in the seventh which included a two RBI double by Gary Owens. The BJ hitters struck out six time the last two innings and 11 times on the night. The same two teams meet Saturday and Sunday night at Brent Gould Field. Golden Plains Credit Union is Saturday night’s buyout sponsor. Hays moves past Liberal into second place at 10-7 after a 3-0 win at home over El Dorado.